Vegas Palms is an online casino that uses MicroGaming’s software for all the games they offer. 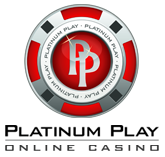 MicroGaming is known for high quality and innovation. 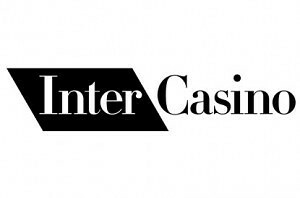 They’re also very constant when it comes to adding new games, especially slot machines. This year alone, there was more than a dozen new games introduced. You’ll find 390 games offered at Vegas Palms, with the majority of them being online slots. There isn’t a single online casino that offers more slot games than Vegas Palms, we can say this with absolute confidence as they’re powered by worlds largest online gambling software provider. 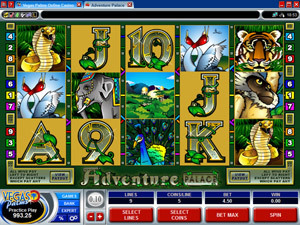 The games can also be played by using either of the casino client versions offered. You’ll find that Vegas Palms offers a chance to download their casino as well as play instantly, in your browser. The latter version will greatly fit those players that are looking to play from their Mac or Linux powered computer devices. Anyhow, you’ll find a really wide variety of online slots at Vegas Palms Casino, but there are a couple ones that we would like to point out. These provide exceptional gaming experience through graphics, features and much more. Mega Moolah – MicroGaming’s most popular slot machine that offers one of the largest progressive jackpots in the industry. It has paid several multimillion ones already and holds one again. Mega Moolah is a 5 reel, 25 pay line slot themed after the wild jungle. 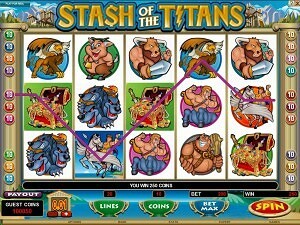 Jackpot can be won via bonus game, which is awarded at a completely random basis. The Dark Knight – a slot game offering 243 ways to win, instead of the commonly known pay line system. It’s themed after Batman and features all characters from the actual movie. You’ll also be able to win free spins and of course the main reason why many people play this slot in the first place – a progressive jackpot, which exceeds $1 million as we speak! Immortal Romance – another of the 243 ways to win slot machines from MicroGaming. Play this slots at Vegas Palms for a chance to win up to 3,6 million coins! Tomb Raider – slot machine created after a popular console game with the same title. You’ll find Lara Croft fighting the bad guys over 5 reels and 15 pay-lines with a chance to win free spins as well as double your wins by spinning the wild symbol. BattleStar Galactica – a 5 reel slot machine that was just recently launched and added to MicroGaming’s portfolio of games. Play this 243 ways to win slot game and win up to free spins or up to 75,000 coins! Play Slots at Vegas Palms Casino and start with $100 Free!